JILA scientists have developed a fast, simple sample preparation method that enhances imaging of DNA to better analyze its physical properties and interactions. Described in ACS Nano, JILA's gentle, yet effective process involves binding DNA to mica, a flat silicate mineral. This process extends the DNA's configuration—similar to expanding the bellows of an accordion—so that eight times more of the molecule can be analyzed as compared to previous methods. Atomic Force Microscopy (AFM) imaging of the extended structures in liquid improved the quality and quantity of biophysical data on DNA and its interactions with proteins. The method produced high-quality images over a wide range of salt concentrations, including ones similar to those found in a cell. This was previously thought impossible because different salts ordinarily compete to attach the DNA to the surface or interfere with that attachment. High-resolution images revealed the DNA's iconic double helix structure, which looks like a twisted ladder. JILA is jointly operated by the National Institute of Standards and Technology (NIST) and the University of Colorado Boulder. "We expect this new sample preparation method to pave the way to tuning the binding strength of DNA to a surface, which should facilitate studying the dynamics of protein-DNA complexes," NIST/JILA Fellow Tom Perkins said. AFM imaging of DNA has previously been performed in both air and liquid, but there is no widely accepted method for preparing DNA in liquid, its normal environment. Mica is an appealing binding surface because it is so flat, but it also has a negative electrical charge, which repels DNA, so surface treatments are needed. Current sample prep methods can result in very compact pieces of DNA, poor images, or salt conditions that disrupt protein-DNA interactions. JILA's five-minute process includes pre-soaking the mica in a nickel-salt solution, gentle rinsing and drying, and binding of DNA to the mica in a solution containing magnesium chloride and potassium chloride. As in a cell, these salt conditions preserve the properties of proteins binding to DNA. After protein-DNA complexes bind to the mica, the final step before imaging involves rinsing the mica with a solution containing nickel-chloride, which traps the DNA structure by increasing the DNA-mica interaction strength. 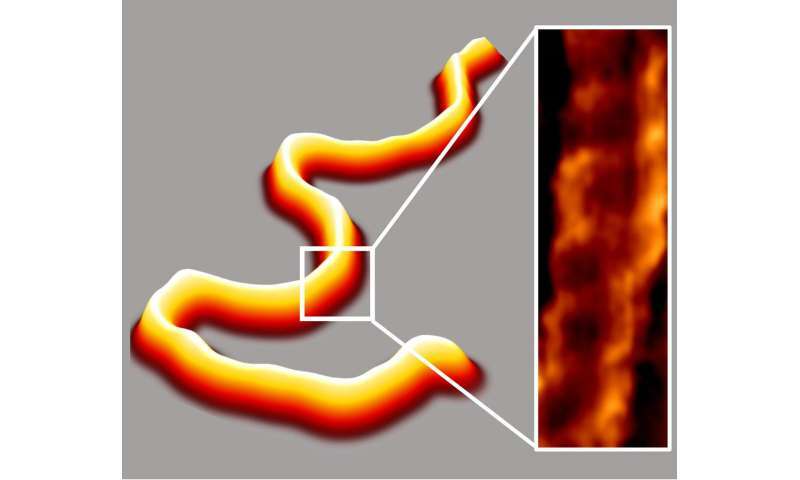 For the first time in liquid, the method produced AFM images of DNA bound to the flat surface without any alterations to its well-known mechanical properties, including its width, length and native backbone stiffness. JILA scientists used the new method to make high-quality images of DNA and two protein-DNA complexes. Enhanced images of DNA-protein complexes will help researchers see new details of processes such as DNA repair and cellular metabolism.